fragment of asponge is capable under favor-able conditions of regeneratinga perfect sponge. A Avell illustrated papergiving an account of the com-mercial sponges of Florida isgiven by Dr. H. M. Smith in Bulletin of the United States Fish Commission, Vol. XVII, 1807, p. 225-240. Among non-commercial sponges, the Red Sponge, (Microcionn p7olifera, Figs, o, 4), is found in shallow water from South Carolina to Cape Cod, and is very abundant upon oyster and scallop shells in Long Island Sound. It can be at once recognized by its brilliant crimson color. When young it forms broad, thin incrustations, but later it gives rise to branches which may be four inches in height. 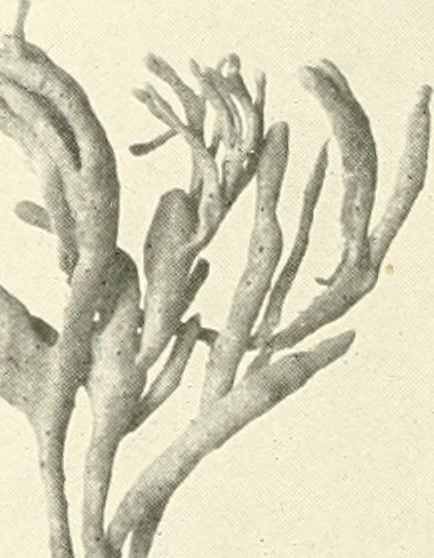 The Boring Sponge, (Cliona sulphurea, Fig. 5), a sulphur-col-ored sponge, is very destructive to the shells of oysters, clams, etc. It comjDletely honeycombs and dissolves the shell, riddling it with galleries and holes, and finally growing over the outside. It is abundant along the shcn-es from. South Carolina to Cape Cod.